Double sized strip! Double-sized strip! These are a rare treat, but always welcome. Love it when Marc does this. As always, we appreciate your support on Patreon. It keeps us going in a very real way. 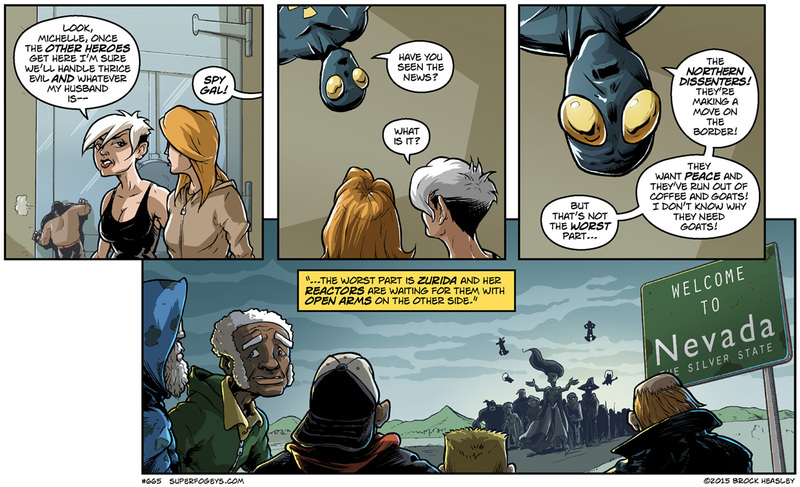 Whew, one of the challenges of reading a webcomic as it updates is that a scene that may only have occurred a chapter ago can be lost in the fog of memory. Are we supposed to know who the Northern Dissenters are, besides the old president who is getting facetime in that panel (and Tangerine, I guess)? We’ve never seen the Northern Dissenters until now. We’ve only heard about them. So, you’re good! Good to see Atomic Fly didn’t die in that explosion after all.